In order to develop a new mobility system for Barcelona, we want to read the city not at the municipal level, nor at the metropolitan, but at a territorial scale, so as to be able to read the Big Barcelona as a system of urban agglomerations along the Mediterranean sea, the density of the different poles increasing as they approach the coast line. The densest part of the city, though, is currently faced with a radial intrusive infrastructure that constitutes a physical barrier between the dense urban fabric inside, and its most valuable assets: the sea front, the range of Collserola, and the rivers Besòs and Llobregat, along with its connectivity with the neighbouring municipalities. 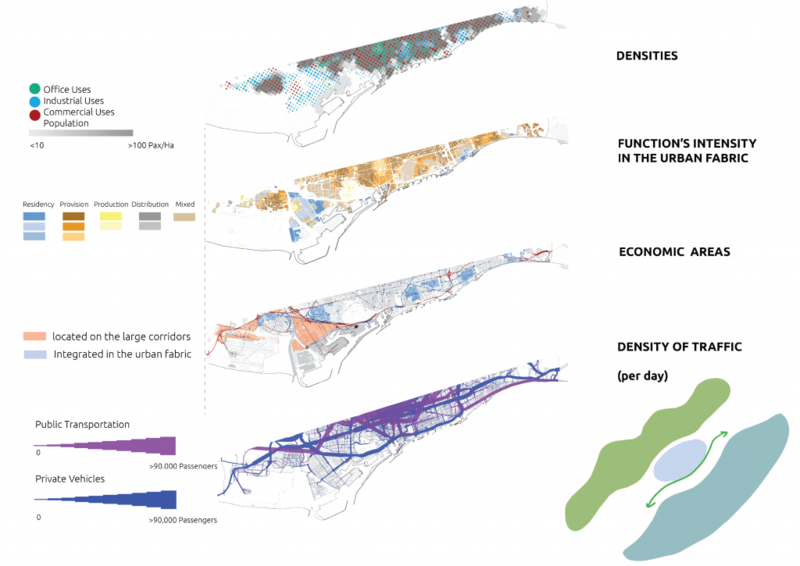 If we want to reconfigure the mobility of the city to be able to serve a linear structure, we first need to open up Les Rondes, downgrade the “vertical” sections adjacent to the rivers, and extend the Ronda de Dalt and the Ronda Litoral to act as horizontal axes connecting the different coast municipalities. Second of all, we need to humanize the Rondas, to turn the barrier into a carpet. 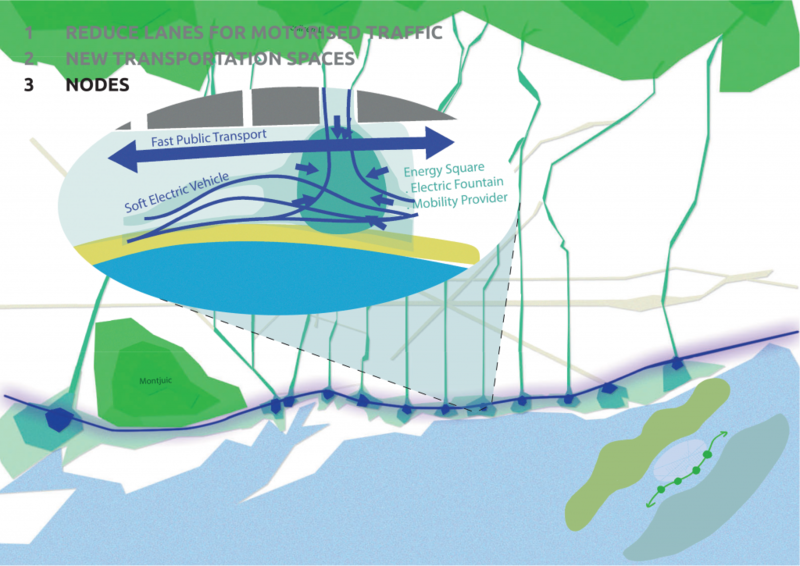 This project will try and find how to do that in the first one of this axis, and the one that is most challenging for it is separating the densest area of the city with its first and most valuable asset, the sea. 1) Analyzing the urban context around Ronda Litoral to understand the implications of Ronda and the urban fabric on each other. 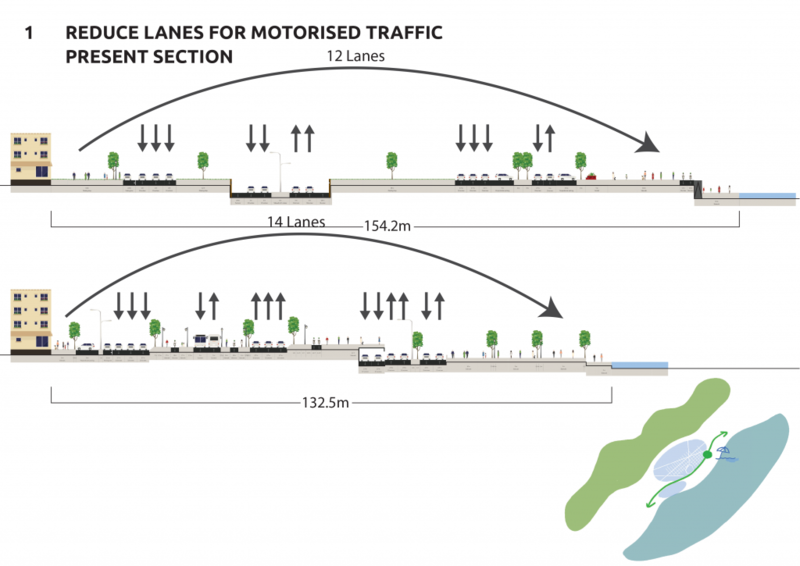 The analysis includes different densities, activities, and traffic flows. 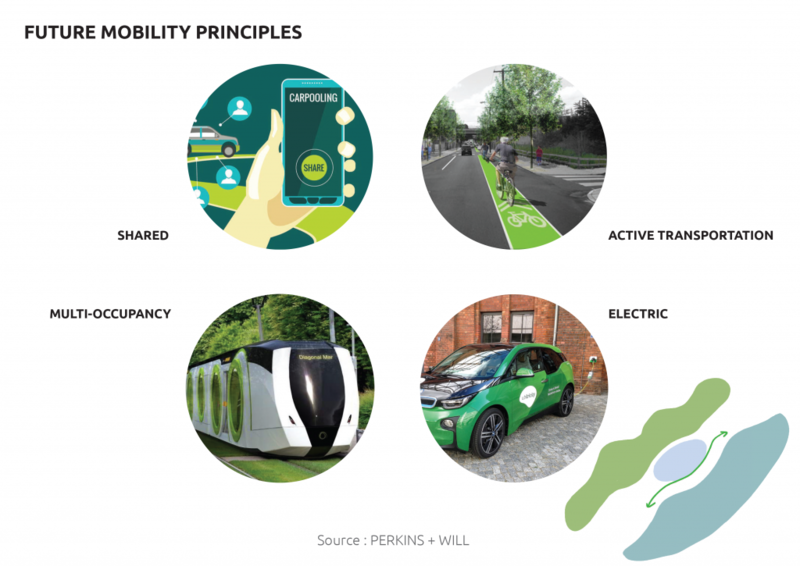 Electric Vehicles are here to stay, so we have to think of planning policies and design strategies to adapt the mobility infrastructure based on prospective needs. Electric Vehicles are not only cars, but they also include Segways, “patinetes”, etc. We call these types of vehicles Soft Electric Vehicles (SEV). Their presence is not circumstantial, but they will play a structural role in the future mobility of Barcelona. 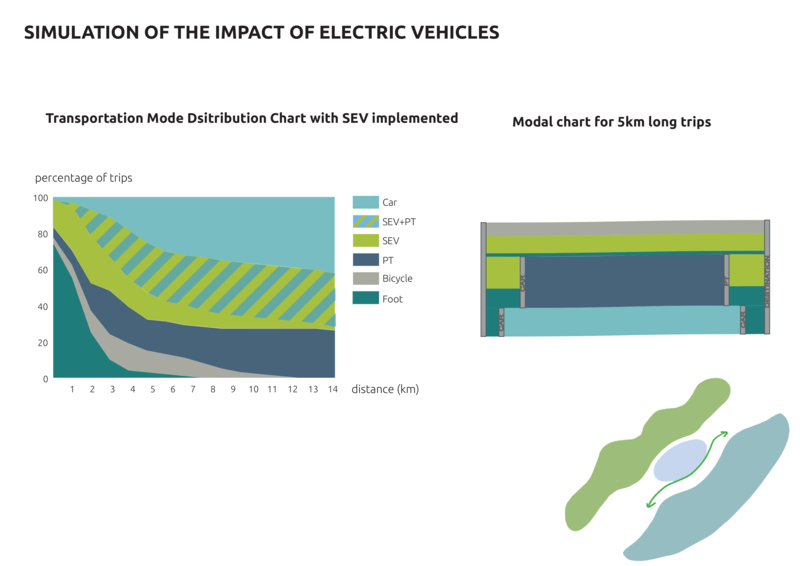 SEVs can also have a great impact on the transportation module share and interchanging. The important issue for these type of modules is batteries and energy, and Barcelona is already paying attention to this matter by expanding the charging stations. However, it is missing the attention to the area along Ronda Litoral. Based on the two steps above, we are proposing Ronda Litoral as a GREEN ENERGY CORRIDOR “Green” for creating green public spaces, “Energy” for electric vehicles, and “Corridor” for horizontal connectivity. 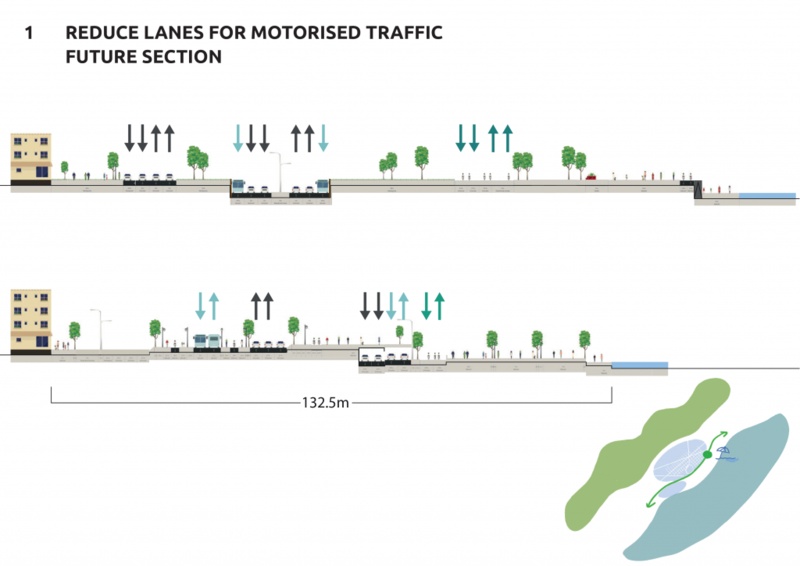 1 Reduce the number of lanes. 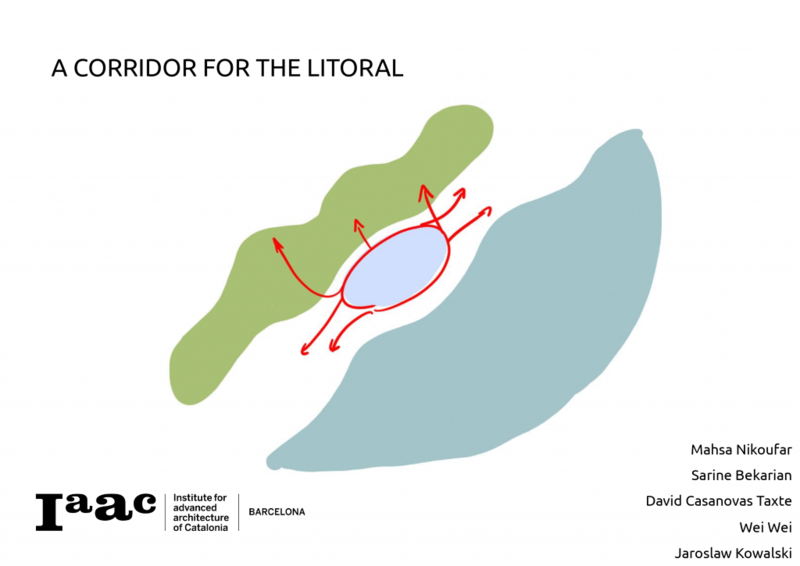 When analyzing the physical object of la Ronda Litoral, we realize that apart from the fast lanes, the north-east half of it is populated by a ridiculous number of adjacent lanes, that add to the moat of la Ronda, another barrier that makes the crossing of it an excruciating task. On the south_west half of it, the Ronda is accompanied by an incredibly large number of rail tracks for the transportation of goods from the port to the logistics area. We will reconquer the space used by these underused lanes on the east, and the underused track on the west, and give them back to the pedestrians. When freeing all this space, we get an opportunity to give space to new nonintrusive ways of moving, namely the Soft Electric Vehicles. This means reserving some linear space for new forms of more humanized, individual modes of transportation, in the most flexible way so as to be able to host future ways of moving still unknown to us. We will complement that with a new Public Rapid Transportation in the moat of la Ronda Litoral, one that can be light, modular, and that will load and unload without the need for ramps, but straight onto the platforms, the Nodes. 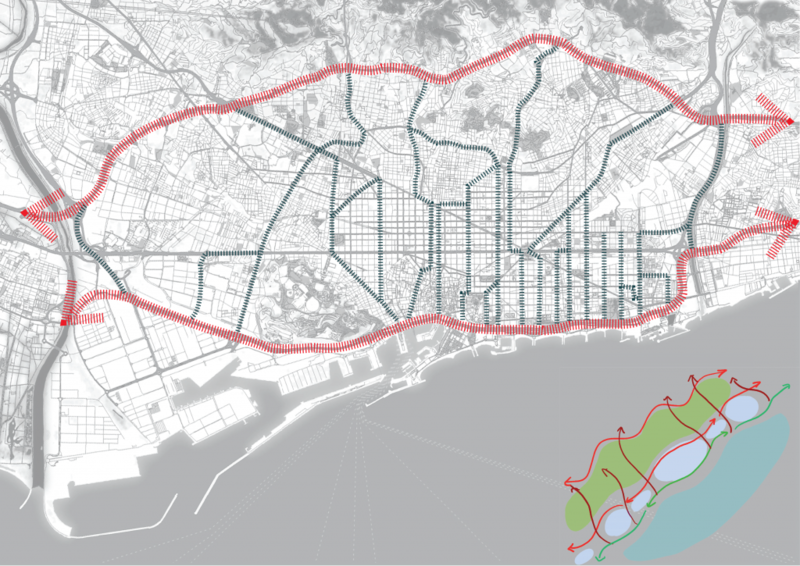 By analyzing the vertical flow of people inside Barcelona, we have identified main “streams” of people and carefully placed our nodes where these streams meet the Litoral. Rapid PT Stops: the implemented Public Transportation will load and unload in these spots. Shared SEV stations: point for rental and drop-off of Soft Electric Vehicles, the intermodal transportation mode in Barcelona. Charging Points: the nodes will be Electricity Producers and Sharers, acting as Electricity Fountains for citizens to collect electricity in a shared space. With these functions acting like magnets, these public spaces will become active bridges that will gather urban activity around them that which shape and configuration will change through time on that public carpet. In the east side of la Ronda Litoral, these nodes will be the stitching of the city to its already public seafront spaces (the beach in some points the docks in others). In the west, these nodes will act as Gateways to future conquest of spaces that are now occupied by the industrial port of Barcelona, namely, the Zona Franca. The nodes will take different shapes depending on the context, and will evolve in time. We have, however, simulated one of them in Vila Olímpica, with both the perspective of 15 and 50 years ahead, to try and imagine the abilities of the space to transform and host new activities in a changing demand. And who knows, maybe in a few years we will be riding our new shoe shaped SEV on a charging pavement, from the new Museum of Mobility in the port in Zona Franca, to the beach Xiringuito in El Masnou, to then take the Rapid Transportation back, sitting and watching people move in a thousand different ways in the First Seafront Energy Corridor of the Mediterranean.